My longtime readers probably know by now that I am a total dog lover. Our three dogs, Foxy, Bailey and Toby, are spoiled rotten! One of the ways we spoil them is by feeding them dog food that they love, like ALPO® Chop House wet dog food with their regular dry dog food. While they would prefer to be fed only wet dog food, both of our little dogs, Bailey and Toby, are Shelties, and an exclusive diet of wet food isn’t so great for their teeth. That’s why the ALPO’s variety dog food are so perfect for us; we can mix them in with their dry dog food occasionally so that they’re still getting a delicious meal that they love, but we don’t have to worry about over doing it! When our dogs see the ALPO® Chop House cans, they get so excited! I tried to snap some photos of them jumping around and wagging their tails, but as you can imagine, that’s hard to catch on camera! Foxy howls her furry little face off every time she sees me grab a can of ALPO®, can you tell how excited she is? ALPO® Chop House wet dog food is something that both dogs and their owners can get excited about: great taste, nutrition and variety too! Every can of ALPO® Chop House wet dog food is 100% balanced, complete with quality ingredients like healthy protein sources, wholesome grains and accents of vegetables. All of these ingredients make a complete and balanced diet for each life stage. So we don’t have to worry about the age difference between the dogs; Foxy is nine, Bailey is four and Toby is three. It’s nice to only have one kind of food to feed all three dogs, instead of sorting through different foods for different ages. With the dogs going crazy every morning and afternoon at mealtime, it’s nice to not have one extra thing to worry about when I am trying to feed them! ALPO® dog food helps support a happy, healthy life, a shiny coat, strong bones and teeth. You know what they say, right? That means that our dogs are more playful with each other because they feel good! It’s so funny to watch Bailey and Toby wrestle around and play with each other, they act like puppies together! 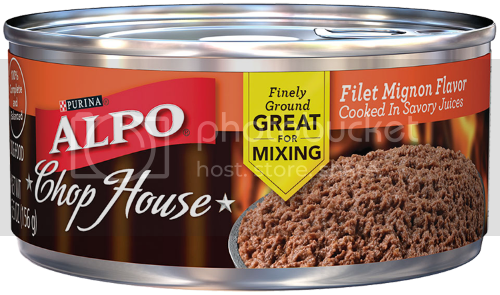 ALPO® Chop House comes in small cuts or finely ground that is great for mixing with dry food. We really like this because it allows us to treat the dogs with wet food but there’s no leftovers, so we don’t have to store any cans in the fridge. ALPO® Chop House 5.5 oz. is a compact can that is also a great mealtime option for smaller dogs! When I am feeling lazy and don’t want to mix their food, I feed Bailey and Toby their own can instead of mixing it with dry food. It’s the perfect amount for them! Foxy’s obviously needs more – which is fine because hey also come in 13 ounce cans, which is the perfect size for her (she weighs over 100 lbs). ALPO® Chop House 5.5 oz offers flavors that your dogs will love! They have T-Bone Steak Flavored Cuts, Tender Cuts With Lamb, Filet Mignon Flavor, and Rotisserie Chicken Flavored Cuts. I purchased a variety pack so that the dogs could try a few different flavors, and they all seem to like them the same. I don’t think my dogs are too picky when it comes to ALPO®, they love them all! Like ALPO’s Facebook Page and follow ALPO® on Instagram. Beautiful dogs first of all. I don’t have pets but I want my dog to be just as healthy as me. We just got a dog (Milo) in December, so we have been playing around with foods for him. Different brands and some wet and some dry. I haven’t tried Alpo yet, but I know it’s a great brand, so I will have to pick some up for him. What beautiful pups!! That food looks so quality! Foxy is so pretty! We don’t do wet food in our house, but if we did, Alpo is a well known brand that we would trust! Your dogs are so cute! My boys keep asking us for one, but we’re still holding out. I told them if they could convince their uncle to give us his dog(who is adorable and so well-behaved- I wouldn’t have to worry about training), then sure. My brother is not having that, though. I miss our dogs. We are now down to just our cat. They loved Alpo though! We don’t feed our dog wet food. My parents have used Alpo though and love it! Your dogs are absolutely beautiful. We have recently tried this Alpo food and my dogs are huge fans now too! They hear the cans and come running! We’ve tried wet dog food with our golden in the past, and he didn’t care for it. Maybe we should try again and offer him this?? I love your dogs! My mom has a dog (we have a cat) and we’re very concerned about our pet’s health. Only the best for our fur-babies! Your babies are all so pretty!! My Toby loves the ALP Chop House too! I’m loving all these doggy posts today! Looks like they enjoyed it!! We always had Alpo for the dogs too. I remember the red can!! Love the photos of your pups!! Finding a good dog food is important! You want the best for them! Beautiful dogs. I am a huge dog lover (and a dog owner) so I love any dog related posts. What cute dogs you have!! Our dog passed away about 3 years ago but when he was with us Alpo was the way to go! Your dogs are beautiful. My pups go NUTS for wet food! Your dogs are absolutely beautiful! It’s so important to think about what they’re eating. We did an insane amount of research when we got our dog on the best diet- it’s so hard to find the best fit! Your puppies are so gorgeous and happy! Your dogs look healthy and well nourished so I can tell they are fed good food… Happy Valentine’s Day! Your dogs are precious. They make me want a dog. I volunteer at our local humane society and we have a dog that looks similar to them. Are yours Australlian Shepards? We use a lot of Alpo at the humane society. It goes based a lot on donations, but we receive a lot of money as well that helps us to buy the food and we usually go Alpo or Pedigree for the dogs. I love watching all of the fun, cute things your dogs do. We haven’t had a dog at home in many years, but posts like this really make me miss having a furry friend around. I love dogs so much, but we travel and are gone so much that we’ve decided on just a cat, a bird, and a gerbil for now. The food looks like it’s really good quality! Aww they are cute. My brother uses Alpo wet for his boxer. He loves it. My friends dogs do the same thing for Alpo, they get the bigger cans but I sent them ur link so they can try them.